Giannis Antetokounmpo has been strongly considered as an MVP candidate for the past couple of years and at his young age he's already made a reputation in the NBA. Giannis is now a top 5 player in the league now and when he reaches his prime I believe he can dominate the league and win an MVP award. Giannis may be one of the greatest steals of the draft because he was picked number 15 by the Milwaukee Bucks in the 2013 NBA draft. Giannis' skill set is insane for his size. He can play all positions efficiently even the point guard position on both ends of the floor. He's a deadly finisher and a relentless rim protector. The only flaw in his game is his shooting ability. He can't shoot the three ball consistently and that would be a problem because in today's NBA, the three-point shot is very important as players uses the long range shot as a major weapon. In an interview, Giannis said that he's working on his jumpshot and he's already improved it. If that was true, Giannis will be more scarier and be more unstoppable in offense. Giannis will also become a stronger version of Kevin Durant. Imagine that man, who can guard a stronger and better Kevin Durant? He will be almost impossible to contain and will give a lot of problems to his defenders. Giannis is a strong finisher. He uses his length together with his strength to finish at the rim easily. When you see him driving to the basket, he sometimes uses an early jump where the defender will not expect him to jump already and take a shot. He can jump farther than expected and still finishes close to the rim because of his length. He uses this skill to make the opponent out of timing when defending him. His Euro step is also a nice skill because his opponents will immediately be out of position if he changes direction with his euro step through his long strides. Giannis has high basketball IQ. He can read the opponents movement and think quickly what he will do especially in the situation where the help defense is coming. And when he is in transition, he is nearly unstoppable because of his long strides, strong body and athleticism so he will finish easily at the rim or will draw a foul. Another thing that impressed me is his body and momentum control which makes his moves very effective against opposing players. His not being out of rhythm when making a spin move or a euro step, he still manage to finish with a pretty nice look after making such moves. Players are drawing attention because of flashy moves and a pretty cross over but when I see Giannis drive and floats a hook shot, it was very pleasing to the eye as not so many players are using the sky hook nowadays. Giannis is developing this skill and it's pretty effective because nobody can block his sky hook because of his length. There's something that nobody notice much about Giannis. His strength. I know everybody says his strong but his strength is underrated. Giannis is strong in the post and can make a lot of separation when banging with his defender. He's so strong that even if a center is defending him, he can still manage to make separation and take an easy shot close to the basket. Giannis is also quick and quick enough to catch the ball and immediately explode to the basket even before the defender close him out and stop him from taking a good shot. When he's so close to the rim, the chances of him getting a basket is almost a hundred percent so the defenders should not allow him to get close to the rim. Giannis is very effective in the pick en roll. He improves his skill in the pick en roll when he plays the point guard position for some games. Imagine this, if his primary defender wasn't able to fight through the screen, the opposing big man will be the one to guard him and it's already a mismatch because of his speed and quickness. And when he plays the point, it's already a mismatch because you cannot put a 6'2 or 6'4 guy in front of Giannis because he will immediately destroy them. 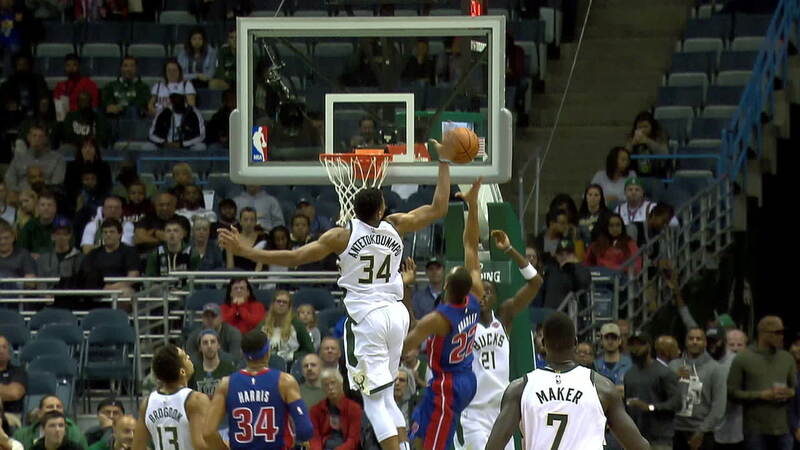 One of the most impressive skills of Giannis is is blocking ability. He's very good in blocking shots in transition and he always comes out of nowhere and making his opponent think, "where did he came from?". Even if Giannis is on the three-point line he will still surprise the offensive player and block him using his length and great timing. I believe Giannis Antetokounmpo will still be in the MVP conversation for years to come and can be the front runner if he truly develop his outside shot. Let's see if he can lead the MVP voting next season. Thanks for taking some time reading my article. I'd be happy to know your ideas and thoughts about this one. Have a great day guys!